In the immortal words of Graham Taylor: "Do I not like that !" Suarez was always a danger. The trouble with your theory Dave is why should Italy try and win a game when they don't have to ? When they play their last match against Uruguay my guess is both sides will rest their top players and set the team up defensively, knowing a point will be good enough to see them both through, assuming Italy beat Costa Rica later today. I would say a 0-0 draw is a good bet for Italy's game next Tuesday and then it won't matter how many goals England put past Costa Rica. It's not a theory Jeff, it's no more than an an unlikely possibility. As I said, there are too many 'ifs'. It could be all over today, anyway. Well, that's put the cat among the pigeons. Costa Rica beat Italy. They will probably beat England too. So it is a real scrap between Italy and Uruguay. Indeed England have been knocked out of the World Cup. I believe Australia are out as well. Some sport websites say Luis Suárez may sign with FC Barcelona for $70 million. Could save him from a less-than-warm welcome if Luis returns to his current club, Liverpool. It could be all over today, anyway. Well I guess I shouldn't have tempted providence! I have a soft spot for the Dutch team though so I am rooting for them, now! 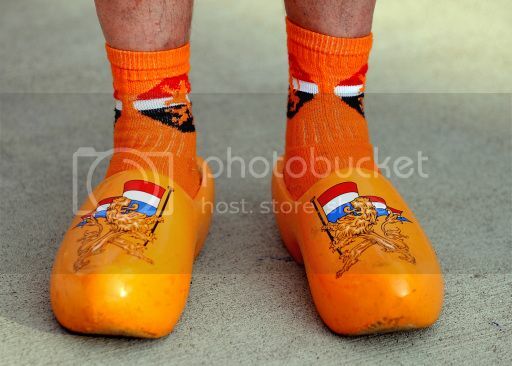 I hope the Dutch don't get disqualified for wearing clogs instead of football boots! I blame Gary Lineker for wearing a blue shirt ! He obviously jinxed the game ! Italy were SO poor they got caught offside 11 times and so England are out after only 2 games for the first time in their history. :-[ I think I'm going to stop making predictions in this World Cup ! 9 changes in the England team to face Costa Rica at 5pm. Mr Hodgson has been busy rearranging his deckchairs on the Titanic ! Fans who paid thousands are not happy to watch a reserve team. Costa Rica are very happy to play one. On the other hand, the USA team are going great guns and would have qualified on Sunday but for a last minute goal by Portugal. If they don't get beaten heavily by Germany on Thursday, USA should still qualify for the knockout stage - and even with a significant defeat they may still qualify, so good luck to them! As England are eliminated, my support is currently for the Dutch team. Yes, England's 0-0 draw with Costa Rica and Uruguay's 1-0 win over Italy means means Costa Rica and Uruguay go into the knockout phase. The main talking point however was the bite Suarez took at his Italian opponent. He has done this before. Someone get that man a muzzle ! As you say Dave there is an interesting encounter today between Germany and USA, all the more interesting since the US team are coached by former German star Jurgen Klinsmann. Both teams have 4 points so a draw would see them both through to the last 16 but I've a feeling Mr Klinsmann would prefer a win ! Mrs Merkel has been seen at previous German matches. It must be nice to have an economy so efficient it can run itself ! Suarez was asking what the team would have for dinner before the game. Someone suggested an Italian! Luis Suárez has been banned for four months, so he could be back in time for his big night - Halloween! John Suchet played the perfect piece for him on Classic FM yesterday - Suárez Musicales by Benjamin Bitten! Sorry Richard. I need reminding how to embed a video ! Very well done to the USA, who have now progressed further in this World Cup than some of the top European teams: Spain, Portugal, Italy and England! To embed a video, just click on the clapperboard icon and enter the video's URL in the pop-up box.